Create a complete display using our Natural Pine Portable Wood Countertop Display Cases. Maximize your counter space and display your fine watches, jewelry, and other accessories with style. 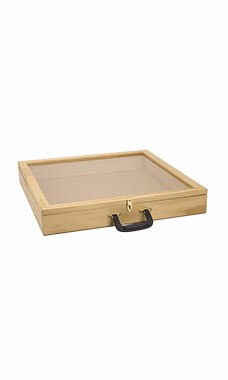 The wooden countertop display case is a warm and eye catching countertop or tabletop display. The finished wood frame features a natural pine finish with brass hinges, black handle, and a shatterproof clear plastic top. Each case comes with 2 dowel rods to raise the top for immediate access to merchandise. It's easy to add a touch of charm to your retail store and improve sales with this Pine countertop display. Overall size measures: 24" x 24" x 3". Available for immediate shipment. very pleased with this case. I will be purchasing more. This is a wonderful display case for the price. The poles aren't really usable...just don't stay up. Slightest wind or movement on the table crashes them down. Instead I just place a cloth in the corner and that works even better. I love the fact that it uses plastic instead of glass. Makes it so much lighter to carry. There is a wonderful handle you will need a drill and screw driver to add. It wasn't hard to add. And the handle is very handy. I wish there was a cloth-type carrying case to add a little protection; however, I added velcro to the box and cut out a place for the handle, added some scrap fabric at the bottom and it functions as a protective case. I used this case to display dog collars. I was surprised on how much product it held. The wood grain looks great and clear cover allows you to see everything inside. You don't have any blind spots. I wish I had found this before I wasted my money on two upright cases.